It’s a clichéd truism that moviemaking is a collaborative art. Of course it is, and there are dozens, if not hundreds, of examples of directors working time and again with the same crew members, trusted writers, cameramen, production designers, editors, even costume designers, to prove it. We all know about the collaborative relationship between Fellini and Nino Rota, between Hitchcock and Bernard Herrmann. But what interests us the most is the collaboration between a director and a star. The examples are legion: Griffith and Lillian Gish; John Ford and John Wayne; Kurosawa and Toshiro Mifune; Rossellini and Ingrid Bergman; Hitchcock and Cary Grant, and also James Stewart; von Sternberg and Dietrich; Antonioni and Monica Vitti; Ingmar Bergman and, it seems, every actor in Sweden (Max von Sydow, Liv Ullmann, Bibi Andersson, Ingrid Thulin, Erland Josephson, Harriet Andersson, among others); Godard and Anna Karina; Truffaut and Jean-Pierre Léaud. And that’s just the tip of the iceberg. Make up your own list. It’s a good parlor game for movie mavens to play on rainy afternoons at the summer rental. 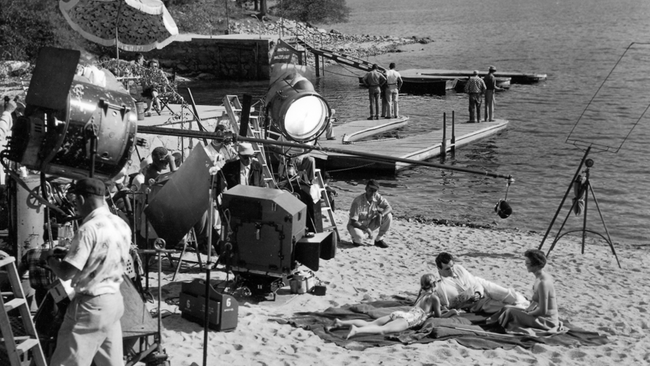 In heyday Hollywood times, a director’s using the same actor or actors over and over again may have had more to do with studio contracts and who was available than with personal taste and affinities. For example, director Henry King made eleven films with Tyrone Power and six films with Gregory Peck. King and both actors were under long-term contract to 20th Century Fox, and there weren’t that many top male stars to choose from. Michael Curtiz and Errol Flynn made twelve movies together at Warner Bros. Obviously, they must have enjoyed working together, but it may have been more a marriage of convenience than of affinity. 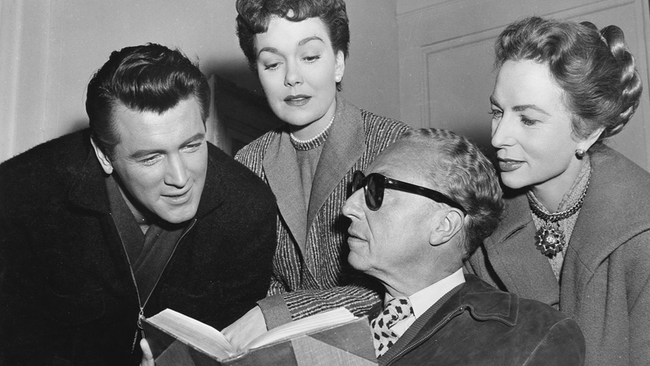 One of the most important Hollywood director-actor partnerships was between Douglas Sirk (né Detlef Sierck in Hamburg) and Rock Hudson—nine movies at Universal, the smallest and least important of the major studios: Has Anybody Seen My Gal? (1952), Taza, Son of Cochise (1954), Magnificent Obsession (1954), Captain Lightfoot (1955), All That Heaven Allows (1955), Never Say Goodbye (1956), Written on the Wind (1956), Battle Hymn (1957), and The Tarnished Angels (1958). (Although Sirk is uncredited on Never Say Goodbye and disowned the movie, he did work on it, and there are so many similarities and points of reference in it to other Sirk movies, both thematically and emotionally, I feel it should be counted.) 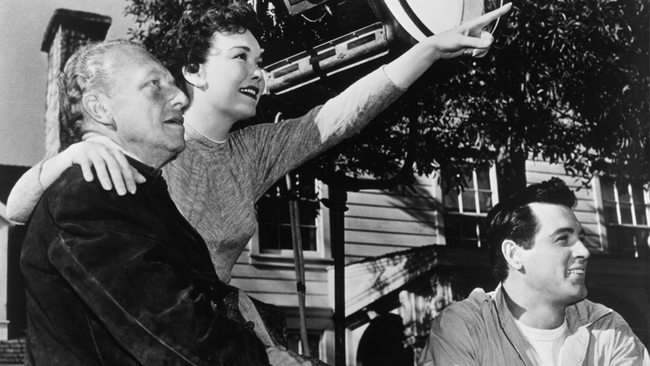 Maybe it was a shotgun marriage—Sirk was one of the studio’s most important directors, if not the most important, and Hudson was one of the very few stars at the company whose name meant anything at the box office. But there’s more to it than that. It’s a strange phenomenon about Sirk: so many of his films are centered around mother love, either thwarted, obsessive, overly protective, or rejected, or various combinations thereof—Schlussakkord (1936), La habanera (1937), All I Desire (1953), Imitation of Life (1959), and, yes, even Never Say Goodbye—or have parents with spoiled, selfish, even monstrous teenage children, as in All That Heaven Allows and There’s Always Tomorrow (1956), one would never guess that one of the major tragedies of his life involved his son. His only child, from his first wife, was born in 1925. She became a Nazi Party member in 1929. When Sirk married again, to Hilde Jary, a Jewish actress, his first wife refused to let him see their son again. Sirk and Jary left Germany in 1937. His son, Klaus Detlef Sierck, had been a child actor in Nazi films, including several by the most notorious of all Nazi directors, Veit Harlan, who made the infamous Jew Süss. Sirk’s son died at the age of eighteen, fighting with the German army on the eastern front in 1942. No parent, however estranged from his child, ever recovers from that. The only picture of Sirk’s that even touches on this subject is perhaps the most personal of his films, A Time to Love and a Time to Die (1958). A Time to Love and a Time to Die, a sympathetic story of a young Nazi soldier on the eastern front, was greeted with head-scratching bewilderment when it first appeared. It was only thirteen years after the war had ended. The world was still recovering from the revelations of the Nazi atrocities, and here was Sirk making what seemed like an apologia for the Nazis and sympathetically portraying the hardships and devastation ordinary Germans had had to bear during a war that they unleashed on the world. But today it can be seen for what it was: a devastating picture of the destruction that war visits on everyone, victims and perpetrators alike—and one of his most heartfelt films. It was also an unvarnished attempt to reconcile with his estranged and long-lost son. Let’s put it another way. Hudson, who was born the same year as Sirk’s son, said, “He was like ol’ Dad to me, and I was like a son to him, I think. When you’re scared and new and you’re trying to figure out this thing, and suddenly an older man will reach out and say, ‘There, there, it’s okay,’ that was Douglas Sirk.” For his part, Sirk saw something in Hudson that he responded to, and especially something the camera responded to, which had possibilities. After having worked with Hudson on Has Anybody Seen My Gal?, in which the actor is remarkably effective in a light comic role, and Taza, Son of Cochise, Sirk felt Hudson was ready for, and fought for him to be in, Magnificent Obsession. Sirk, ever the aesthete, was never quite as sentimental or as gushing as Hudson in interviews. “He wasn’t very much, but he was also very young. At Universal, he was considered a very bad actor. However, he was very eager to learn. His dream was to become a good actor, and I can say, not without pride, that I helped him become one,” Sirk recounted in a 1967 Cahiers du cinéma interview. Hudson became a huge star as a result of being in Magnificent Obsession. To capitalize on this newly earned stardom, Sirk and Hudson (as well as Jane Wyman, the star of Magnificent Obsession) made All That Heaven Allows, another movie ostensibly about a young hunk in love with an older, more conventional woman. Hudson doesn’t have much to do except keep his pompadour in place and wear a series of stunning lumberjack plaids. But he suggests an unwavering masculinity as a perfect foil to Wyman’s brilliantly nuanced and conflicted performance. (Check out her dazzling, tossed-off delivery when her daughter says that at least they don’t bury the wives along with their deceased husbands, the way they did in ancient Egypt: “Don’t they? Maybe not in Egypt.”) Written on the Wind gives Hudson many more opportunities as the embittered and cynical, but nevertheless loyal, retainer to the oil-rich Hadley family. His stolidity balances and keeps a lid on the excessive theatricality and self-dramatization that characterize the Robert Stack and Dorothy Malone characters. There was also The Tarnished Angels, which we’ll get to later, but by the time A Time to Love was made, Hudson was too big a star to play such a relatively undemanding role, and furthermore, his authenticity as a young soldier would have been undermined by the familiarity audiences had with Rock Hudson the star (and, in any case, Universal was grooming John Gavin, who played the role, to be the next Rock Hudson). Perhaps the most touching part of Magnificent Obsession is that it spells out so boldly, and in a very direct way, the connection between Sirk and Hudson. Otto Kruger, a dead ringer for Sirk, plays Hudson’s teacher/guru/role model. He is the guiding, mentoring father figure. He teaches him the meaning of what will eventually become the magnificent obsession of the title for Rock—giving to others and asking nothing in return—and is there to guide him in moments when he feels he can’t quite live up to his own expectations. Rock, who becomes a surgeon in order to cure Jane Wyman of her blindness, which he caused in the first place, has to operate on her. The resident doctor is not up to the task, and it has to be done immediately. What the medical emergency is, is never quite explained. Neither is a reason given for Otto, a painter, to be allowed to watch the operation from a raised, glassed-in amphitheater, usually reserved for other professionals and medical students. But let’s not get bogged down in annoying details here. Before the operation, Rock falters. He isn’t sure he is capable of doing it. He glances up at Otto, who beams down on him and smiles encouragingly, as if to say, “You can do it.” Not that he knows anything about the complications of the operation itself or even the medical procedures involved. But it is a symbolic, paradigmatic moment in which the father figure, from on high, gives the son permission to be all that he can be—Sirk, the director, the father, is giving Rock, the acolyte looking for guidance and reassurance, the permission and encouragement to be Rock Hudson, one of the biggest stars of the fifties. Sirk ultimately paid Hudson the highest compliment he could give when he chose him to play the lead in The Tarnished Angels, an adaptation of Faulkner’s 1933 novel Pylon. If A Time to Love was one of Sirk’s most personal films, equally close to his heart was The Tarnished Angels, a movie he had wanted to make since the thirties, when he was still at UFA. Hudson’s is a thankless role, an alcoholic newspaper reporter who is outside the main story until he insists on forcing his way in, but he is really wonderful in it. It ranks with his very best work, along with Seconds (1966), and suggests the actor Hudson might have been, given the right roles, which clearly Sirk was capable of giving him.